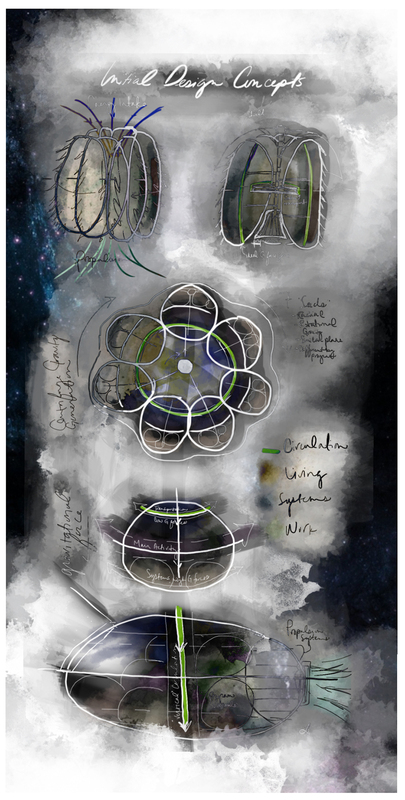 The architectural thesis by Leah Alissa Bayer, MECHA:spore is a graphic novel featuring character-architecture symbiotic bonding which illustrates the enriching experience of designing and inhabiting a living architecture or starship biosphere. MECHA:spore, Earth’s spore, is a fortified catalogue of knowledge and library of life, born from Earth and propelled to replicate among the stars. Design of the built environment, fortified by brute force technology of the Industrial Revolution, has become a liability in terms of ecological degradation and deserves an elegant retooling. By way of graphic, plot-driven storytelling, MECHA:spore appeals to emotions and seeks to explore the possibility of a different built environment - grown, adaptive, cyclical architecture, developed during a biological revolution occurring hundreds of years post-Earth collapse. Character-architecture symbiotic bonding illustrates the enriching experience of designing and inhabiting a living architecture or starship biosphere. MECHA:spore, Earth’s spore, is a fortified catalogue of knowledge and library of life, born from Earth and propelled to replicate among the stars. 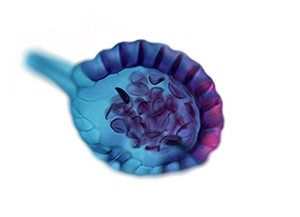 spore: a unit of asexual reproduction that may be adapted for dispersal and for survival, often for extended periods of time, in unfavorable conditions. MECHA: derived from the Japanese abbreviation meka for the english word mechanical. a science fiction genre that centers on robots or machines controlled by people from inside. 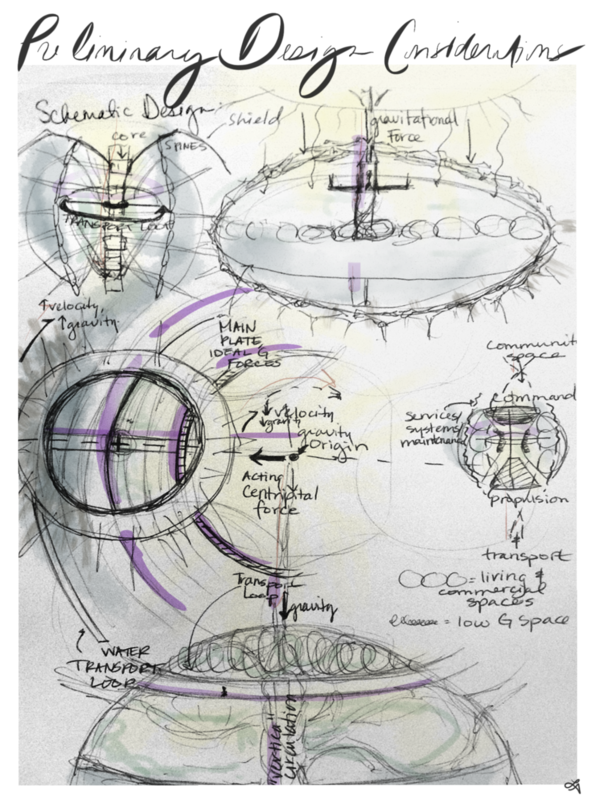 MECHA:spore is the embodiment of my goal as an architect – to construct fully integrated, living structures. 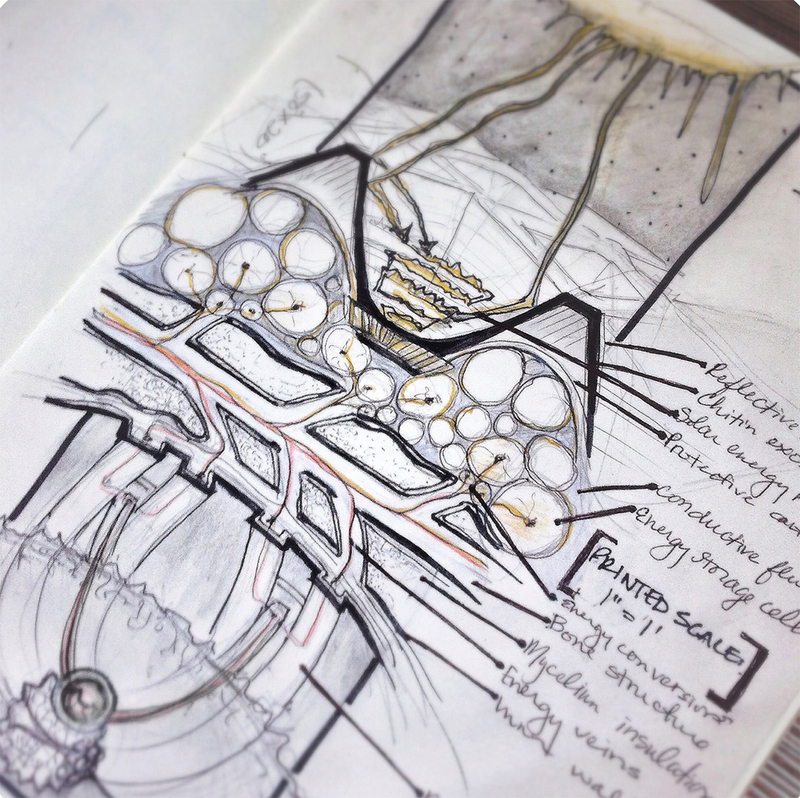 A biomimetic architecture not just inspired by nature, but existing as nature. Framed in historic knowledge of the built environment and materials, born and grown from organic material, or a heart, to deliver a living, breathing machine. I intend to build coral reefs on land, where humans are one of many species living and contributing to a beautiful, sustainable, diverse ecosystem. Home is where the heart is, but where is the heart, exactly? 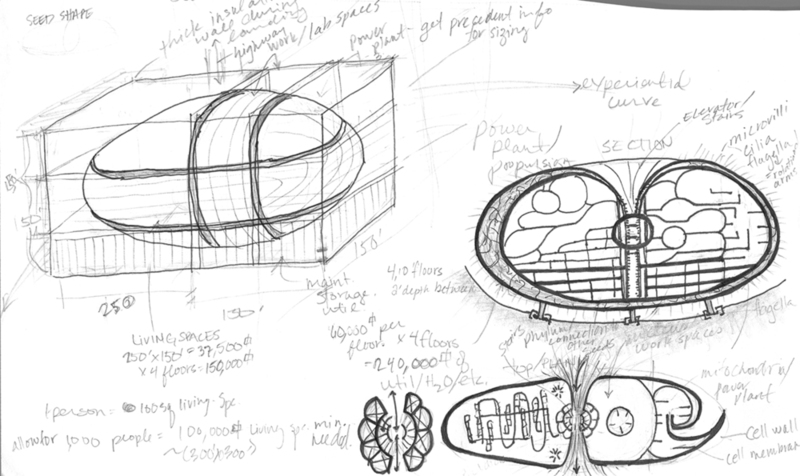 In my senior thesis, MECHA:spores represent a hybrid of built metal frames, living, bioengineered grown material, and a nanotech based AI system for communications between user and spore. United, it houses a group of seeds to propagate life on another planet once Earth is exhausted. Think panspermia. From Earth, through space, to a new earth, like the life cycle of the immortal jellyfish, Turritopsis nutricula. Although MECHA:spore may seem to be science fiction in appearance, there is currently a venture termed Project Persephone by starship research and development group Icarus Interstellar establishing such a living technology for future manned missions to deep space. The creative age of ecology calls for the development of ideas once believed to be fiction. We’ve come to understand that our monocultural lifestyles, desecration of ecosystems and biological diversity, and manufactured toxic materials and byproducts are devastating our home. We are now due for a revolution, especially in the built world, focused on biological integration for ecological preservation. Architecture nourishes, warms, protects, and activates its inhabitants. Then, does our architecture not deserve a heart? Bioengineering, neoplasmatic design, biomimetics, closed-loop systems and their applications in the future are the inspiration for my project. Architects are no longer carpenters – we must be interdisciplinary orchestrators. The thesis focuses on the consequences of our divorce from symbiotic relationships with Earth and other species and showcases a possible future: our effort to start again with the knowledge of the past. It suggests that in our pursuit to understand our world, we must come full circle and return to it with a living architecture; missing our chance to do so on Earth, our attempt begins by locating and inhabiting a suitable replacement planet. By addressing the “what if’s” of reimagining our built environment too late, the thesis places the importance of immediate change today. Ultimately, this is the story of our success after failure. Currently, a good majority of architects are hinting at reestablishing natural connections to Earth by pushing the importance of sustainability, but this is mostly due to a reactive mentality. It is imperative that we continue this pursuit but implement a stronger vision for the future by understanding a complete integration of all systems and parts of life: tech, mech, flesh, spirit. The architect must be the composer of these architectural vessels so that we no longer feel removed from the natural world. In doing so we will gain a better appreciation for and understanding of our relationship to Earth by scaling down the largest issues we face today to a relatable, individual level. The book is presented as a post-apocalyptic graphic novel for strong delivery impact of the issues addressed. While it appears as futuristic fantasy, possibly unrelated to current architectural issues, I believe a first-person graphic, emotional story is appropriate for the material at hand. Looking at architecture as a living organism versus the structures we’ve known for millennia might be a difficult shift for most. By placing the idea on a dramatic stage, there exists enough distance to experience the thesis as entertainment. At the same time, however, this distance allows a familiar level of comfort, opening opportunity to form an emotional attachment to the heart of the thesis: in order to survive, we must adapt. It is time our architecture evolves from painted dead skeletons to an integrated species, a shell with a soul, deserving of belonging to this world. Copied here from there original location for preservation, below are a few entries from the thesis blog, cataloging progress and shows. Show’s a Wrap, Book’s a Go! Last Call has been called! The Chumash Thesis Show was a great success and it was such a pleasure experiencing the entire architecture class showcasing their work in unison. This was the first time the thesis show was planned and held by the students themselves, and we did well! 119 students gathered over the weekend to show their work at the Chumash Auditorium on Cal Poly’s campus. The most intriguing element of this show was the tremendous variety displayed by the projects. Some of my favorite works were pleasant surprises I had yet to have the pleasure of seeing before the event – featured student projects shown below. There is compelling work going on here and I’m proud that Cal Poly has allowed us to push the boundaries of what the future of architecture looks like. We’re on the edge of exciting times and I’m confident I’m among a talented group embracing the changes to come. Personally, I am happy with the diverse presentation style I was able to bring to the table. It’s difficult to stand out in such a large showcase, but my designated slice of the floor definitely set a dramatic stage. The majority of projects were shown on rectangular posters hung from a skeletal frame of wood or metal within the allotted 5′ cubes. Due to the futuristic and speculative nature of MECHA:spore, I thought it’d be fitting to create a theatrical space that would remove visitors from any context and allow them to immerse themselves in a different world. To do so, I constructed a simple black box of fabric and PVC cut to size, and hung my pieces within the curtains to give them the illusion of weightlessness (like deep space). The pieces were then lit with small spotlights for mood, and a built element sat center stage to draw people inward. Finally, for a little magical touch, I lined the ceiling of this space with sheer fabric and LED strand lighting to imitate twinkling stars above. It was a magical experience sitting back and watching people wander into the little black hole to read my book and check out my artwork. While I wish I had had more to show in the space, I’m happy with the final result. I think people were tickled by the unique display and I’m proud to have brought a little wonderment and a lasting impression to my Last Call show. I am fortunate to have had friends, family, and advisors came out to see my work and I couldn’t be more grateful. My mother and sister flew down from Washington to show their love and endless support (and keep me relaxed and happy!) and my boyfriend helped me countless times through some physically and mentally exhausting moments throughout the weekend. I couldn’t have stayed grounded without their network. My advisor, Donna Duerk, also made and appearance to impress upon me some final thoughts and wisdom and wish me luck in my upcoming pursuits. Her wisdom has been invaluable. Friends Stacy and David Pascolla came to show their support after helping guide me with life tips over the past couple years as a student finding my way. And finally, my mentoring thesis professor and I caught up during Saturday’s opening to reflect on my career at Cal Poly and discuss where the “round peg in a square hole” of a student is headed, as she put it. Thank you so much to all of you, and so many of those that wished me luck over the past week! Your support means everything! I’d love to put up a full reflection and critique of the Synthesis Show that ran yesterday and this morning, but all free moments are dedicated to final touches before the big Chumash Showcase this weekend! We would love for everyone to attend, so if you’re nearby, head over to the Chumash Auditorium on Cal Poly’s campus for a compelling show put on by our thesis class (see invite at the bottom of this post). In the meantime, here a few shots from Synthesis. A special thanks to Tim Dunn for helping me setup and exhibiting tremendous patience during the past couple weeks! And finally, you’re all invited to the Chumash show, Last Call! This is my first time growing mushrooms and has been a lot of fun. I started by pasteurizing a substrate of coffee grounds, brown rice flower, and vermiculite in the oven at 180 degrees for a few hours. The material was brought to a clean room (all items in near proximity sterilized with hydrogen peroxide) to inoculate it with oyster mushroom mycelium I ordered online. I covered the brick with foil, placed it in a sterile container, and added soaked perlite at the base to maintain moisture. I placed the piece in the window to heat up each morning by the rising sun. In a few days the brick was solid white. It’s almost completely colonized with zero contamination! After that stage, I’ll dry the brick out and fit it into the detail frame I’ve built (details below). The detail frame has been a challenge. The piece has to serve multiple purposes: display a wall detail, contain a poster describing the relationship between story telling and architecture, house the Arduino, motion sensor, motor, and LEDs, act as an anchor for the steel cables, and provide a central point for the illustration wheel to rotate about. Whew! Construction started with an aluminum drip pan, perfect size. I bent an aluminum strip into shape for the exoskeletal frame and wrapped a plastic garage liner around the circumference to represent a permeable membrane. The top layer was filled with hot glue, representing shape-holding cartilage. I then sprayed foam insulation into the next section for an insulative, non-conductive fat layer. The next chamber was sealed with acrylic sealant and filled with resin, glass, paint, and bubbles. The last area is reserved for the mycelium once it’s finished colonizing the substrate. It’ll be fitted and then carved out to make room for a clay chamber and wires, representing 3D printed bone and electrical pathways. Next up is illustrating the story wheel. I’ve decided to do a split screen, showing the story from various perspectives. The outer edge will be 3rd person omniscient for a universal context and understanding. The inner ring will be 2nd person perspectives to give a human viewpoints. Last, the interactive display in conjunction with an audience will represent a first person experience. By pairing the story ring with the living detail, I’m highlighting the natural cycles of life and all it contains, suggesting architecture should take better care to fit in with that cycle. I’ve got one week left to put it altogether with the programmed Arduino/components, main architecture poster, and show booth setup. Crunch time! Drawing for the next few days before finishing up construction for show #1! Once the shows are over, I’ll have a month to finish the book, the aspect of this thesis I’m most excited about! The deadline to the end approaches! Check out the promo video for our final show, featuring commentary on the Cal Poly thesis program by our thesis mentor faculty. Last Call: The 5th Year Final Show from Coasting Toaster Productions on Vimeo. Below is the video of my review held by a panel of thesis professors and mentors. I continually struggle with the battle between doing what is asked and expected of me versus following my own intuition and goals. The other night I was asked by a follower on Twitter how did you manage to find a professor willing to mentor your thesis? The question had me giggling, but upon attempting to respond, curiously, I struggled to find an answer that didn’t sound ridiculous or childish. Honestly? I had never considered before that someone could tell me what I can and can’t do. I was born with this attitude. But now, after close to 30 years of battling myself in pursuit of anomalous interests and cultivating related skills, I realize I might be perceived as more controversial than I see myself: a headstrong rule breaker, an anti-social stubborn wanderer, the black sheep. It’s been extremely difficult accepting, embracing, and promoting what I believe, battling with depression most my life. But I’ve never been the rebel kid, either. Always this inbetween-er struggling to fit into this or that extreme of social and academic circles. Feeling lonely and disconnected from my peers led me to leave school for some years to reevaluate. This now seems to be a common battle with creative friends of mine that, despite choosing a seemingly boundary-pushing career path, feel like their hearts lead them against the stream more often than not. I firmly believe, though, that if you understand who you are what you stand for, it is essential to push through the friction to realize your vision – no matter how difficult and full of doubt and confusion that fight might be. It’s like a tapas bar of science fiction. I don’t disagree. But what happened after the professors let go and allowed their imaginations to take over was brilliant. It’s a seed, right? And a seed has tremendous potential – it could be anything. Is it a garden? Does it even survive? There’s something full of terror here, too. It’s intriguing and fascinating and has limitless potential. What you’ve done here is set the stage for a beautiful screen play. This is the scrolling text at the beginning of the film. And now I want the rest of the story, I want to watch the movie. The background is a set of conditions determined by extrapolating how we create and destroy in the built environment today. It is the prologue to the story, an imagined setup, and exists as a platform for the thesis. The main thesis project is the spore, the contained realization of my research and proposal. Ultimately, it’s an embodiment of life, community, and potential. This is the part and where I’ve focused my energy on development and detail. The future is my link to my peers. Originally I planned to develop the story into the future, describing the evolution of the living architecture from seed state on the new planet in my final chapter. But here’s a better idea: document the imagination of everyone that reviews my project and, at the final show, present illustrations of the array of alternate endings as imagined by my community. I am SO excited about this idea for multiple reasons. 1) it allows me the opportunity to focus all my energy on one phase; I’ll completely detail and develop the spore, the potential, the setup for a new type of architecture. 2) it allows my peers the opportunity to connect to the thesis by encouraging their imagination, their visions, and their participation in realizing the future. 3) it generates an active understanding of the thesis by participating in a collective storytelling. This is life. We are given a set of tools and conditions and are required to participate together (or not) toward realizing a future out of an infinite array of possibilities. There are no guarantees, but there is freedom and comfort in taking part of a larger picture – connecting to an enormous community. The more support, curiosity, and intrigue I receive from my peers the more I want to give away the project, include people, make them understand how important they are in what I am doing. Finally, there is a level of cleaning up and dumbing down I am required to do for the Qualifying Review this Friday, as instructed by my mentoring professors. I’ll be working on cleaning my graphics and simplifying the poster for quick read and ease of understanding – this one got away from me with trying to incorporate all the suggestions on content to include. I understand that most people will only be affected by a very brief encounter with a poster and I have to tailor my visuals to that short moment of impression. It might have been pretty, but it was ultimately confusing at first glance. Finding the balance between maintaining the conceptual, dreamy tone of this project and laying out simple, relatable graphics is one I still struggle with, but I take solace in knowing I can flesh out all the details in my book for those that want the whole story. Look for my call for community participation in envisioning the final chapter of my book in the next coming weeks. * I imagine I’ll begin to open the platform for submissions to this phase during my spring break! I cannot wait to see what others imagine! *This reminds me, I’ll be posting the narrative leading to the future chapter in the next couple weeks. First: having updated tools to do my thesis work has been overwhelming and a tremendous time saver. I’ve been able to produce a couple presentations in an incomparable amount of time with relation to my previous laptop and with a level of clarity in graphics that I had no idea was possible. Let’s see how long I can make this one last. Now, back to thesis work. While this project certainly satisfies my thirst for unending knowledge and limitless exploration in all fields of life, is it also a lesson in creating strength through focus. It’s been far too easy to get lost in the depths and details of every little aspect of what goes in to designing a multigenerational starship and far too difficult to decide how to present all of those pieces and findings. I’ve noticed the development of my final presentation for the quarter is following a path leading to inevitable graphic overload and has me reevaluating exactly what I intend to communicate – what is the main point of this thesis and what do I hope to have at the end of this year of study? Starting with a strong concept is relatively easy if you’ve found inspiration. Maintaining focus and concept strength, however, is a tough task during schematic design exploration. I met today with a former professor from Cal Poly, Donna Duerk, to discuss her opinion of my development thus far and to gain some insight on the basics of aerospace architecture – a specialty of hers. The meeting was both grounding and freeing – I’ve been in need of a like-minded outlet to express my thoughts and share dreams with as well as have the ability to turn to a resource with the experience to understand that this type of project has the tendency to scatter focus and ultimately slip away from its initial concept. This type of thesis isn’t common in the architecture department and has so far been a fun discussion point with faculty and students but not one many have enough experience in to discuss at length and detail. Donna began the conversation with a singular point: focus. Set up a hard list of assumptions and design everything from that point and around the decided project purpose. Tangents are fun and often necessary to an extent, but ultimately my challenge is to tie everything back to a singular thread in order to develop a meaningful and impactful presentation. Additions for the next review: Add two columns to this poster: one for a list of assumptions, and one for a hand-drawn illustration of the story as written so far. For the remainder of the quarter: focus. Make decisions and finalize the design plan: one choice for each piece needed to put together such a massive project. Start planning deadlines for writing, and begin submitting writing for publications. Next quarter: I’ve made the decision to take only thesis and focus all of my attention on this project. I’ll be transitioning out of my full-time job to prepare for my move, making choices towards a career related to my passions. A couple weeks ago we had progress presentations and small group crits. I received some wonderful feedback, notably from professor Humberto Norman, that has helped me strengthen my focus for this living architecture – start with the heart, build from there. I’ve also been asked to make sure the project is relatable as it may be hard for people to connect with such a foreign, conceptual project. Few of us can imagine going to the moon let alone a multi-century journey to another solar system. That might be a difficult task, but I’m up for it! I am currently working on finishing up my first book by next Friday which will cover Episodes I and II of the full, final submission, due to be completed in June next year. Once that artwork is finished I will update with that, too. I’m also concurrently writing the accompanying non-fiction. Both of these will keep me busy over the holiday, I’m sure. My next goal is to begin shooting and animating a short film to help illustrate the project’s ‘aliveness’ and journey. I think this will be an invaluable accessory if I can pull it off. Time to hire a tutor, this is my first attempt with animation, Rhino, and editing a film.